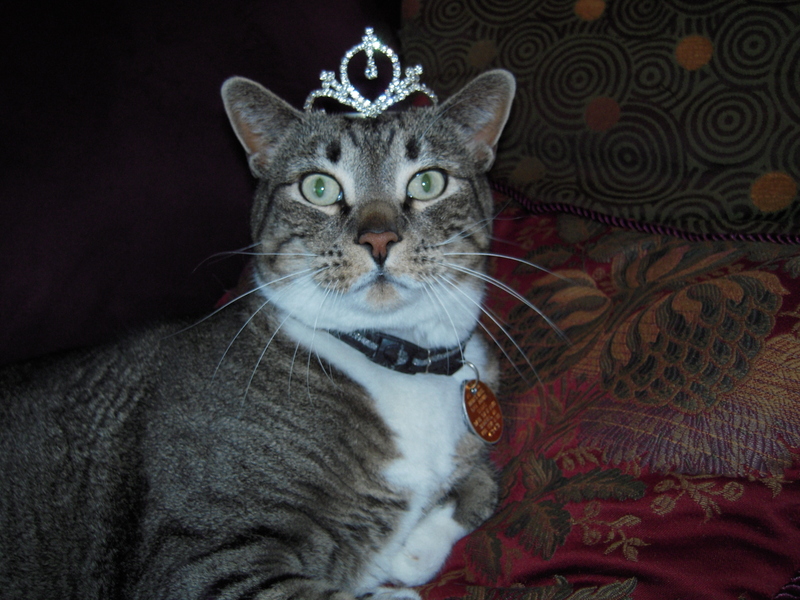 I’ve fallen in love with Ollie, he’s so handsome with his tiara 😉 And I know exactly what you mean about cats seeking us out for our hot flashes, mine won’t leave me alone. Keep the humour and silliness going, the more the better. It helps get us through our challenges and brightens everyone’s day so thank you for brightening mine. (The $1500 is no laughing matter though – ouch!). Sending you and Ollie wishes for happy, healthy times ahead. You are very welcome, Tracy! And yes, Ollie is a very handsome cat, who is sweet and eccentric. The poor guy has a shaved belly and paw from the onslaught of medical tests, a blood draw, an ultrasound, and two organ biopsies. Giving him pills is very challenging. He gets very frightened and as a large cat, who would have been the alpha Tom cat if we’d let him roam, he fights back. So we are creative with crushing and hiding things in his food. His liver medication is supposed to be taken on an empty stomach. I thought, “Gee if the vet has to sedate him just to examine him, how does she think we are supposed to jam a pill down his throat?” I put it in a pill pocket (a little malleable cat treat with a pill sized hole in it) and hope for the best. He keeps them down and does seem to be feeling better so I hope it is working. If his follow up labs suggest otherwise, we’ll need to put our thinking caps back on. The title is what drew me in. I enjoyed reading about Ollie and hope he (and your checkbook) make a speedy recovery. Thanks, you Traci. Thanks for reading my blog and I hope you will return. Our cat, A, had hyperthyroidism, too, and there’s a company that makes those pills (metho-something) in squishy chew pill form. He scarfed them down. Is that an option for Ollie??? There’s also a company here that does NOTHING but irradiate cats’ thyroids at $700 a pop. That blew our minds. We were further told that A needed $2k in cat dentistry, and the only cat dentist was in Portland…and would require an overnight stay for us at a hotel.. After we stopped laughing, we realized they were serious. We went with the squishy pills, skipped the glow-in-the-dark thyroid treatment, and continued to laugh about the idea of driving to Portland, staying overnight in a hotel, so some vet could pull our cat’s teeth. They must suggest this stuff cause people are willing to pay anything for their furry family members. We did once pay $1300 for B to have her ACL surgically repaired, but that was pre-kid. I think Ollie’s worried about you. Hi Beth. Unfortunately, he would eat the hypothyroid medicine but was unable to keep them down due to side effects. P.P.S. Ollie may be worried about me, but I’ve been treated for cancer for over five months now and his increased interest in me has only been since I was thrown into menopause and the weather has gotten cooler. Oops, Beth. I didn’t see your full reply when I read it before. Ollie’s got bad teeth, too but they have just said that other than yearly cleaning and addressing any infection that may arise, that his teeth are just going to do their own thing. Hey, the price here for thyroid irradiation is $1000. We will likely do it. There’s no kitty health insurance plan. And like you say, he is our furry friend. There’s an idea. Blow-up dolls for cats! I don’t think blow-up dolls for cats would last long, unless they were made of wetsuit material. The cost of irradiation has probably gone up since A got diagnosed. Poor Ollie. So I know he interrupts your sleep but maybe he is also providing you with some healing as well? Who knows…A mutually beneficial relationship. Thanks, Karen! He certainly has provided me with lots of purr activity. The scariest thing about Ollie is that he lost 3 pounds in 4 weeks. That’s a lot for a cat, even a big one. It was almost a 20% weight loss. I don’t want him to waste away to nothing! But I understand the guilt, too. I am ambivalent. Another thought….saline=salt……Ollie want a cracker? Ha! I finally get your joke! P.S. I thought taking funny pet photos was THE LAW. Oh, I am so happy to hear that I am a law abiding citizen!